Work continued on establishing the condition of the structure under the floor boards in the cargo holds, which this time moved to the rear hold. 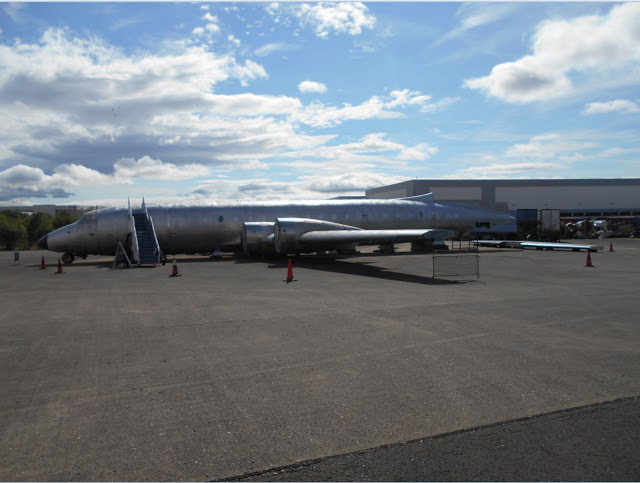 During the day, 2 floor boards were lifted, which were located next to the cargo door, and further forward on the opposite side. It was not necessary to lift the boards the side of these, as it was possible to see the area beneath them from those we had removed. In the case of the 2nd board that was lifted, you could see under the next 2 boards further forward as well. So in total that meant 6 sections of the underfloor structure had effectively been checked, and all were dry. As before, the vacuum was used to tidy up the areas where the boards were taken out. The vacuum, however, isn't very effective, so the results weren't as good as they could have been. We agreed that a good bagless vacuum should be on the shopping list! Yet again the lighting inside the hold meant it was necessary to use the 2 lights on the tripod again. The extension cable for this would be needed for the vacuum anyway. Some of the photos show the stuff that had to be removed, in order to gain access to the aforementioned floor boards. According to the label you can see on 1 of the 2 mirrors, they are from the toilets. Does anyone know if this is true? Everything was put back with the exception of the electrical connectors and suitcase (which we checked was empty), which were moved under the workshop container. Another task that carried on from the previous weekend, was the sorting out of the tools. Given the forecast had predicted rain, this was carried out inside the aircraft. Pictures show the BA spanners, the imperial c-spanners/adjustable hook wrenches, and the metric c-spanners. The c-spanners shown had markings on them, but what they mean eludes us. As before any tool that was in a bad condition, bent, unmarked, or if they were it wasn't legible, were put into a separate pile to be thrown away (in future). The results of the tidy up can be seen here.